Wanderlusters, what makes your heart rate speed up? Watching sunrise at Giza at the Great Pyramids? Or watching sunset over Tanah Lot at Bali? For all travel lovers, shutter-bugs and adventure seekers out there, here’s the ultimate list of incredible travel experiences that will blow your mind, change your world view and let you dig down deep into foreign culture. Boasting one of the biggest and baddest national parks in Serengeti and 16 national parks in total, Tanzania is the perfect place to watch the annual wildebeest migration. Watching baby elephants playing with their moms and pops in the muddy Rufiji/Tarangire River is one of the epic lifetime experiences to keep in your memories bright for decades. Fees start from $60 per visit and you can check the full list here. Now if you have enough skills and bald courage, heli-skiing is one of the life changing experiences! Named as best for “Off-the-beaten-path powder hounds with an aversion to glamour” by Nat Geo, Girdwood has loads of incredible hills and off-pistes where you can be the first one to shake off the powder. Day trips with 16,000-18,000 vertical feet of skiing guaranteed start from $1,275 per person. The days when the Germans lose all their stiffness and the whole city Munich goes on one crazy beer party! Oktoberfest will start on September, the 19th this year and last till the 4th of October. Check out more details at the official website. Last year a liter of beer was priced around 10€ (~$11.77) on average. Spain’s brightest feast is held on the last Wednesday of August when the whole town of Bunol goes covered in gooey red tomato paste. Early in the morning many trucks full of ripe tomatoes arrive to the city center. As the first brave soul climbs up into the back of the truck and throws a tomato – the Biggest Food Fight in the World officially begins! Yet La Tomatina is not all about practicing your accuracy by throwing tomatoes at random folks. It is actually a week-long festival also featuring music bands, parades, dancing, and loads fireworks. Right on the night before the great tomato fight, everyone is invited to compete in a paella cooking contest. Participation fee: 10€ (~$11.77). Meditate with a view of gorgeous Lake Mulshi, while nourishing your body with special foods and your soul with healing practices. Yoga holidays will bring the much needed balance back into your life and allow you to discover something new about yourself. Besides, you can’t miss some of the most amazing temples in whole India – Shreemant Dagdusheth Halwai Sarvajanik Ganpati and iconic ISKCON NVCC Temple! Among the things French know best is how to create perfectly delicious, work-of-art-styled pastries, desserts and sweets! Step closer to the culinary magic and learn to bake macaroons or crunchy lemon tarts during your next visit to France. Best memories come in taste, right? Prices start from 95€ for a two-hour class (~$112). One the mysteries the humanity failed to solve is who, how and why created a series of huge statues made of solid rock and how they were transported and erected at various places around the island? Spectacular Easter Island is 3,800km west of mainland Chile with flights from Santiago taking around five hours and cost 650€ (~$765) return. Get absolutely bewitched by this incredible phenomenon Mother Nature saved for northern dwellers! Green, indigo blue, yellow, purple – these are just a few colors to light up in the skies! Abisko National Park and Jukkasjärvi and the Torne Valley are among the best places to watch the wizardry happen! Yes, there’s a whole festival in France dedicated to the new wine, released each year on the third Tuesday of November, just a few weeks after the grapes were harvested. It’s actually not even one, but 120 festivals held all around Beaujolais wine region with the most famous one – Les Sarmentelles – held in the city of Beaujeu with numerous wine and food tastings, competitions, live music and dancing for five days straight. This year the celebration falls on November, the 19th. Venice is a grand and elaborate city to visit at any time of the year, yet during the carnival it bursts with even more colors when the local crowd dresses up exquisite costumes and masks. Held from Jan, the 31st till Feb, 17th, there are numerous performances and parties you cannot miss! Check out the carnival program to find out the best dates to visit! 2,600km of fascinating coral formations of all shapes and colors, diving at the Great Barrier Reef is like getting into another universe! It does not matter whether you are a diving pro or are just planning to earn your certificate as the Great Barrier will leave you speechless in any case! Prices depend on your qualifications and start from $150 per diver. Plunge into the magical world of Middle Earth at Matamata in the North Island of New Zealand. Whether you are a Lord of the Rings fan or not, you need to see those perfect little hole-houses of Shire hidden in the emerald sloppy hills! Tours start from $75 per adult. Imagine over 2000 temples, lying down in the valley hidden in the morning mist. As the sun rises, they slowly emerge from the white covers and turn deep golden. It looks so beautiful that it hurts! Get magical views of the Harbour and Sydney Opera Theater by getting over your trembling knees and going all the way up the bridge! Guided climbs are offered daily by Bridge Climb Sydney starting from AU$ 148 (~US$ 128). 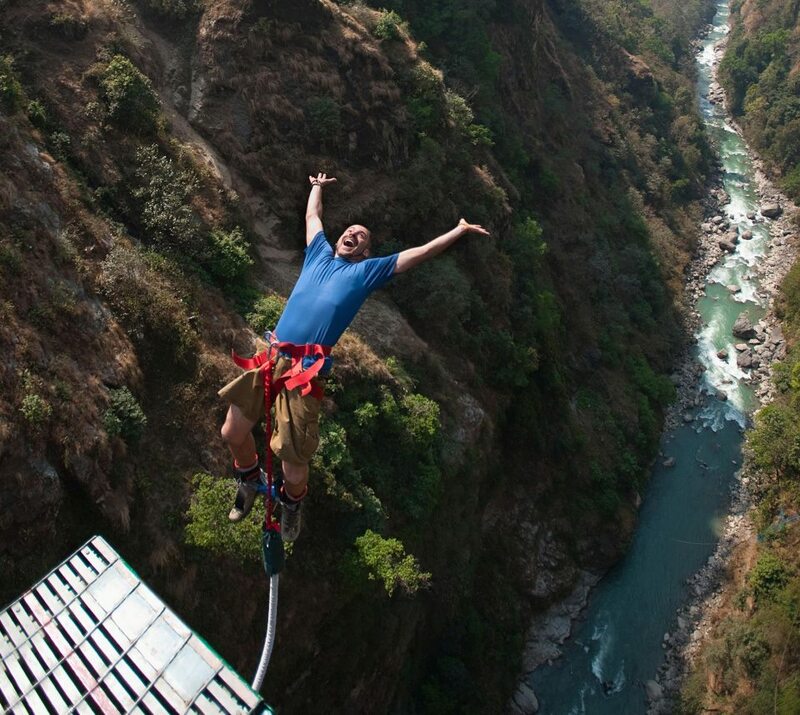 Named one the longest bungees in the world as you jump from the bridge, right into a scenic 160 meter deep river gorge! Prices start from $145 per person. The slowest, yet the most scenic train route in the world. Glacier express connects two major mountain resorts of St. Moritz and Zermatt in the Swiss Alps. You won’t get bored during 7.5 hour journey as you tour over 291 bridges, through 91 tunnels and across the Oberalp Pass on the highest point at 2,033m while watching (and snapping) breathtaking alpine landscapes outside the window. Get ready to pay $146.23 one way in 2nd class and $257 in 1st. The largest lizard species to be found on Earth, more specifically at Lesser Sunda Islands in Indonesia. Witnessing those huge lazy fellows soaking the sun is merely spectacular. The biggest population can be found now found in Komodo National Park. Entrance fee – just $1.6, plus $4 for your camera. Just 150km north-east of Kuala Lumpur, Tamana Negara park is the place where you can still meet a family of elephants while wandering through 130 million years old rainforest jungles. The entrance fee is ridiculously low: 1RM ~ $0.28$, plus 5 RM: $1.4 for your camera. The Holy city of Varanasi exists for 2000 years already. It’s a controversial, yet spectacular place where you can merely hop in the boat at one of the ghats and slowly sail along the shores to witness the whole cycle of life – from small kids learning to walk on the steps, to mid-aged men and women doing the laundry and bathing a few meters away, and finally funeral fires set at the most distant ghats where the passed-away are bathed in the Ganges for the last time and cremated on a holy fire. Prices for a boat ride highly depend on your bargaining skills, but shouldn’t be more than 250 INR (~$4). Basically, it could be anywhere in the world, but I would choose the Togian Archipelago in Indonesia. There are plenty of deserted, nameless islands around Kadidiri, including Karina beach islet where you can bathe at the shimmering golden waves at night when the glowing plankton comes close to the shores. Needless to say how mind-blowing the views of the Singapore skyline are, right? Staying at Marina Bay Sands is a pretty expensive pleasure with prices starting from S$632 (US$ 479) per night. But it’s all worth to splurge at least once in your life! Witness the magic happen at the sacred Uluru stone in Australia as it turns deep brown and red under the first rays of sun. Come back at sunset when the monolith colors bright orange! A standard three day path costs $25 for adults and I bet you would return to watch Uluru color change each evening! There are over 350 routes to hike up the iconic Table Mountain to get a bird’s eye perspective of Cape Town and nearby Atlantic down below. A day entry pass costs 80 Rands, approximately $7. Take a trip to the kingdom of ice and fire hidden in the heart of the Rocky Mountains. Yellowstone National Park leaves you deeply enchanted with its wilderness and unique, out of this world scenery! The entrance fee is $25 for a vehicle and $12 for each visitor entering by foot, bike, ski or snowboard. Dip your toes into warm turquoise waters at this incredible geothermal pool in Grindavík and marvel the incredible landscapes around while your body soaks and relaxes. A standard ticket costs 35€ (~$41.21) while premium packages can go up to 165€ ($195) per day. Despite having a notorious history of whalers firing their harpoons here, St Lawrence gulf stays one of the best places in the world to watch seemingly smiling belugas and 25m-long blue whales! The peak season is May-September. Mysterious ancient geoglyphs are another mystery mankind failed to unveil. There’s still no proven data on why and more importantly how, those peculiar images were drawn in the southern Peruvian desert about 400km away from Lima. Tour packages vary in price and start from around $180. Over a kilometer of sand stretched along the Pacific coast in Chile, Atamaca is known to have extreme temperature changes from -1°C early in the morning going up to 22°C by midday. Dress appropriately if you plan to explore Valle de la Luna with scenery similar to the surface of the moon or watch mighty El Tatio geysers. Tours start from $600 for a four day trip. The life swirls around the Mekong in Laos! Take a héua sáa (traditional slow boat) to Luang Prabang from the Thai border town Huay Xai to spend the next two days watching how life goes on the shores and grab a few tasty delights from boat sellers approaching your vessel. One way ticket costs $20 per person. Hop on the party vibe and learn to move the local way. Havana has vibrant parties held each other night at nearly each hole-in-the-wall bar where you can also grab a glass of fine mojito before going wild on the dance floor. If you feel like you need a bit of practice first, taking private lessons will cost you around $6-9 per hour. If you are brave enough, learn to ride a sledge yourself and go onto a race through the gorgeous frozen lakes and woods in Lapland! Prices depend on the tour providers and typically vary around 700-790€ ($820-930) for a three day tour. Did you know that Abu Simbel temples were actually built twice? Originally carved out of a cliff in the 13th century BC, the Great Temple and smaller Temple of Hathor were taken piece by piece and moved a few kilometers away in the 60s to avoid damage by the rising waters of Nile. Do not miss a spectacular light and music show held daily at 7pm and 8pm in winter and at 8pm and 9pm in summer. Hiking up over 6.000 meters will not be easy, yet if you can make it – this incredible experience will never bleach through the time. There are eleven main routes to attempt for reaching the summit ranging from 5 days up to two weeks. So it’s up to you to decide how much time your adventure will take! Arguably, one of the world’s most spectacular tracks taking around 24 days to walk in full. The landscapes constantly change from emerald green lush rice terraces at lower elevations, to the lunar terrain northern and finally to the range of 6.000-8.0000 meters high snowy peaks of Annapurna I, II, III and numerous unnamed, yet as stunning peaks out there! I highly recommend taking a bit practice at hiking lower terrains before making your first attempt to conquer the circuit as the temperature and elevation changes can seriously influence your well-being. The cost of the track will vary depending whether you are going to organize everything by yourself (around $20-30 a day) or take advantage of ready-made adventure tours (starting from $900 for 22 days). A lush green valley with a population of indigenous people stayed undiscovered till 1945 when a plane crashed here by accident. The ways of life haven’t changed much since those days with local tribes still preferring peculiar traditional costumes to pants and sneakers and pigs being the main currency and estimate of one’s wealth. Visit the valley in August when all of the tribes gather for a huge festival to show off their archery and skills. Set foot onto the mighty walls protecting the ancient empire and walk as far as you can to sense the glory of this epic UNESCO sight! It will be hard to walk it in full, yet you can always come back once again for more! Entrance fee: 45 RMB (~$7.30). One of the world’s most remote temples, the Tiger’s Nest (or Paro Taktsang) is all worth of time and efforts to get there. Not only is it stunningly beautiful and serene, but it gives you a chance to uncover yet another secret of happiness that Bhutanese people know. Getting wrapped up in layers of breezy silk, your hair decorated with elaborate accessories and face make-uped till you barely recognize yourself is a fun and unusual experience to have in the Land of the Rising Sun. Now you may need a bit of a practice to walk with grace in traditional wooden shoes and obi kimono, but it’s all worth the time till you get carried into the Diary of the Geisha atmosphere at narrow Kyoto streets. Dressing up and a pro photo-shoot will cost you around 9500 yen (~$80). Imposing Potala Palace will carry you away with its numerous stairs, elaborate hallways and spectacular views of the Himalayas. Unfortunately you are not allowed to snap pictures inside, so keep your eye open wide and embrace each detail! Visitors are restricted to just 2.300 a day, so you need to come early and get in line for the tickets: RMB 100 (~$16.15) in slack season (from December till May 1st); RMB 200 (~$32.30) in peak seasons (from May 1st to November). Board the train in cosmopolite Moscow to step out in a week at the Japanese seashore at Vladivostok. Alternatively, you can take a connecting branch heading to China, Mongolia or even North Korea. There’s no right way to take the route – hop off at Lake Baikal or Ulan Ude, connect to the next train heading to Beijing or ride it the reverse way! The adventure can last as long as you desire. A bunk at a 4 bed sleeping compartment from Moscow to Vladivostok will cost you $640 one way. If you ever wondered where the sky meets the earth, it’s here at the Salar de Uyuni – a 9,000sq km mirror made of salt platters covered with water in rainy season (December to April) or becoming an arctic white patchwork desert during dry season. The nearby town Uyuni is 10-12 hours away by bus from La Paz or 7 hours by train from Oruro. Bora Bora looks likes like a heaven on earth even without going underwater. Yet, you’d better not spend all your days beach bumming as the underworld has incredible treasures hidden for you! Grab your gear and get close to the huge floating beasts living in the nearby waters. Don’t get too surprised when you find yourself surrounded with fish of all shapes and colors and meet the eagle, bat and manta rays! Step deep in the lush moisture jungle and track a few kilometers before all of sudden you bump into a family of gorillas leisurely playing at the lake shore. As there are just around 700 mountain gorillas left in Rwanda and Uganda, there’s not much time left to experience this adventure! Entry permits to track cost $500 and entail a group pass for eight people, supervised by a ranger. It may sound like a popular tourist place, but you cannot skip seeing the great Inca temples once in Peru. Get lost among numerous polished dry-stone buildings erected centuries before concrete and cranes where invented, yet still standing tall and shining gloriously in the sunset rays. As visitors are restricted to just 400 a day you should plan you visit and purchase a ticket at the selected date in advance at the official website. The art of the traditional tea ceremony rules have not changed much since the Emperor days. The way how a tea ceremony is performed depends of the time of the day, season, venue and other considerations. All the guests have to take a sequence of special rituals before entering the tea house and keep a special code of conduct during the two-hour (or even four hour) ceremony. You can attend a guided ceremony where you will be explained all the subtleties at numerous venues in Tokyo. Prices start from 8.000 yen (~$68) per person. A symbol of eternal love and devotion, the Taj Mahal gets fabulously colored during early morning hours. Besides, it’s one of those times when you can see the least crowds. Entrance fee: 750 INR for foreign tourists (~$12). How many hours can you spend marveling the paintings before your neck stiffens and your head starts to go round from this insane, dazzling beauty a genius once managed to create? The full admission fee is 16€ ($18.84) with discounted rates offered for youths and scholars. Constant adventuring can be exhausting, right? And once in a while we all just wish to get a relaxing nourishing holiday before getting back on track. LifeCo at Bodrum offers incredible spa and detox programs, developed by a world-known specialist Amanda Hamilton starting from 913$ per week of messages, relaxation and luxury care. Besides, you can’t miss splashing in turquoise waters of the Mediterranean and work on your tan on the white sand beach nearby. Again, the temples of Agkor are a pretty well-known destination, yet by no means it devalues their majesty! Get up early and head across the moat to catch the mind-blowing view of the temples reflected in the golden lake waters. Entrance fees: one day pass – 20$, three day pass valid for a week – 40$ and seven day pass valid for a month – $60. Built in the 5th century AD inside a 150 meter solid rock, the city of Sigiriya was once inhabited by ancient kings and afterwards Buddhist monks. Get lost in the numerous gardens and secret passageways before making your way to the very top where dazzling views of the nearby planes open up! Not to miss ancient mural painting in the inner caves.